Temporary truce ends national strikes through the holidays. Letters to Santa from children in London should have no trouble reaching their destinations, and neither should packages loved ones send to the U.K., following a tentative agreement between Royal Mail and the union its workers belong to. The two parties agreed last week to suspend the national strikes until after the holidays, the busiest time of year for the postal service. The agreement postponed walkouts that were scheduled for this week, as well as legal action the Communication Workers Union planned to begin in response to Royal Mail hiring 30,000 temporary workers to deliver mail backlogs. "We can now have a period of calm where we can take forward modernization in a way that puts the union at the center of what needs to be addressed," reports Dave Ward, the union's deputy general secretary. "Our members will now know we can deal with modernization in a way that gives them improved job security and improved terms and conditions." Details of the agreement were not disclosed, but the temporary truce will give Royal Mail and the Communication Workers Union a chance to look for a long-term solution without distractions, officials say. The union's postal executives unanimously agreed to the deal. "Over the next period, an immense amount of hard work is going to be needed in Royal Mail and the CWU to hammer out the final agreement on the way forward in a company facing a period of dramatic change," says Brendan Barber, the Trade Union Congress' general secretary. Members of the Communication Workers Union voted for the national strike in October to protest low pay, layoffs and working conditions. 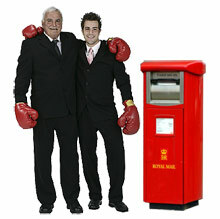 The dispute began about 10 months ago as Royal Mail looked to cut costs in response to declining mail volume. The strike had many people worried about the upcoming holiday season. According to news reports, the number of undelivered letters and parcels reached up to 60 million during the strikes. "Those anxious about sending Christmas presents will sleep a little easier," notes Robert Hammond, of Consumer Focus. U.K. buyers tell of packages left in trash, thrown over walls. Holiday discount offers 25% off Expedited service. Additional work stoppage is possible before Christmas. Shipping services will cost an average of 3% more. Site to remove dispatch time from seller ratings. Consider the ins and outs of international selling as a way to improve your bottom line.